Oh my stars, this is going to be a fun couple of weeks... Puppies were 5 weeks old on Friday... which means it's time to "Pick That Puppy!!!" This is actually a file pic of "Rosie" at 6 1/2 weeks... The computer with the current litter is back home. But if you go to facebook you can see their funny videos... I can't wait to see how much they've grown in 5 days away! I LOVE THIS PART, IT'S SO STINKIN' FUN! Call me. I won't be home until tomorrow, but you can leave a message... or just call me tomorrow. These puppies are all beautiful... sweet, funny and good-natured. They're accustomed to kids, noise, food (they love food! Who doesn't????) and they're very social because they're raised in the house with us. And a few cats and kittens. 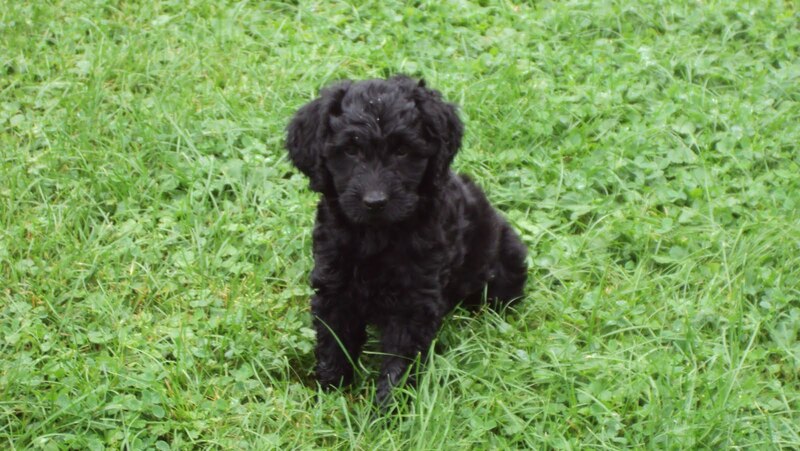 You guys know that most breeders are well over a $1000 for Doodles... that just seemed excessive to us, we wanted beautiful healthy Doodles that an average family can afford. The balance is due on puppy pick up day.... Puppies go to the vet (Apple Country Veterinary in Hilton) on Monday May 13th.... and we'll schedule a pick up at your convenience after that date. Mom is an AKC registered Standard Poodle "Hearthside's Lady Liberty". Dad is an AKC registered Golden Retriever "Hearthside's McDreamy". Give us a call at 585-392-2763... We'd love to talk to you!